Jesús Gutierrez with CEI Contractors finishes concrete Tuesday afternoon on the eastbound half of Florida Road between North College Drive and East Animas Road (County Road 250). Kris Johnson, Florida Road inspector for the city, said paving should continue on the eastbound section through today. 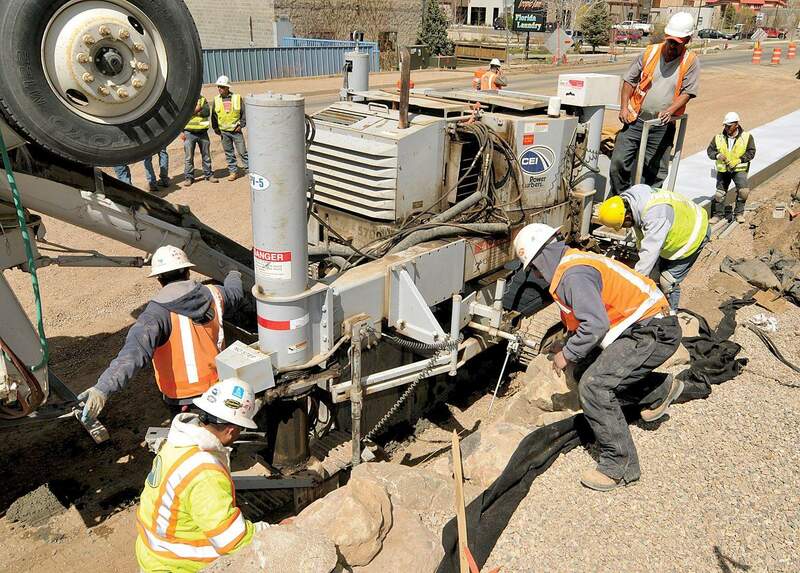 Workers with CEI Contractors and Four Corners Materials lay a concrete curb on Florida Road between North College Drive and East Animas Road (County Road 250) on Tuesday afternoon. Over a year’s worth of detours, dust and delays have left Durangoans in the dark about the future of one of the city’s biggest thoroughfares. But city officials are offering this consolation: Florida Road construction will be complete by the first week in June. The $17 million reconstruction of Florida Road is the largest and most expensive publicly funded project in the city’s history. Gregg Boysen, the city’s lead engineer on the project, said the construction, which was supposed to be finished in December 2010, will move smoothly from here on out because all utilities already have been installed. City Manager Ron LeBlanc said the largest tasks left include working on the sidewalks, paving, installing signals at Florida Road and North College Drive and finishing landscaping. 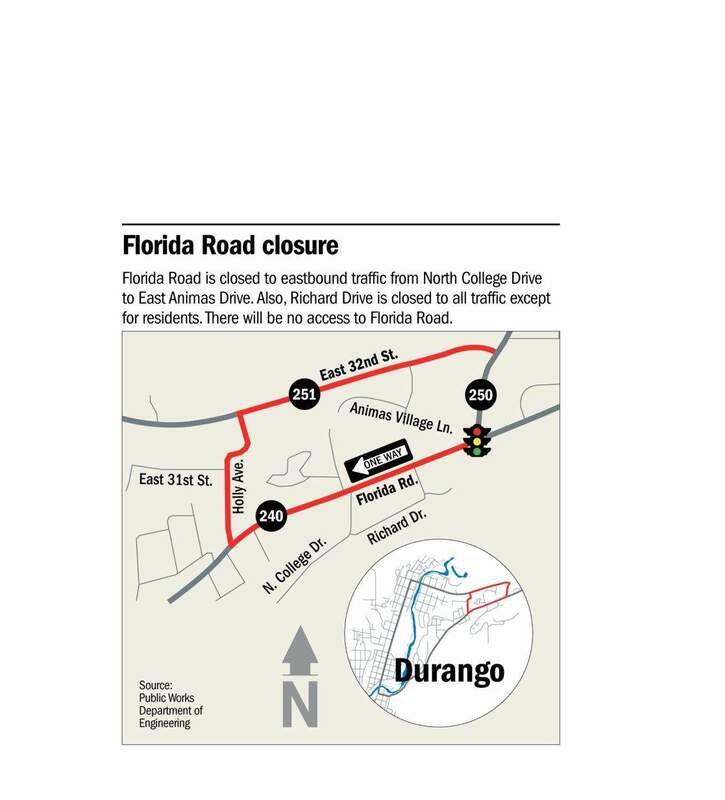 Construction crews began diverting traffic from Richard Drive on Monday to pave Florida Road’s eastbound side from Richard to East Animas Road (County Road 250). The construction means Richard Drive is closed to through traffic. Traffic from North College heading east now is being detoured west on Florida to Holly Avenue, to 32nd Street to East Animas Road. Florida Road remains open to one-way westbound traffic coming into town and open to two-way traffic from Holly to downtown. 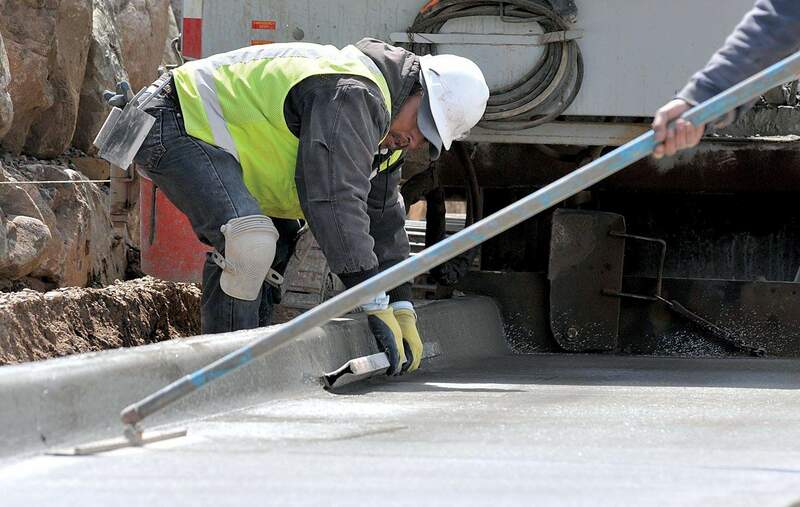 Boysen expects to complete all paving projects by mid-May. The city plans to finish landscaping projects and install traffic lights in the final two weeks of May. When complete, a typical section of Florida Road will feature three 11-foot lanes, two 5-foot bike lanes, 6-inch curbs, a detached 10-foot sidewalk on the north side and a 5-foot sidewalk on the south. Peter Searle, the Durango project manager for Concrete Express Inc., the contractor charged with the reconstruction, said his team will finish the job as soon as it can. One possible hitch: rain. A lot of it could cause delays because construction crews can’t pour concrete or asphalt in wet conditions, Searle said. Heavy snow accumulation and cold weather delayed the start of major construction, Boysen said. A break in a 10-inch water main installed in 1954 led to a cost increase of more than $100,000 and a delay of more than a month, and an uncontrolled spring at Chapman Hill led to the digging of six wells to pump water out of the project zone. Unmapped utility and irrigation lines also caused major delays. With between 12,000 and 14,000 vehicle trips per day, Florida Road is the busiest city-maintained road. Reconstruction of the road, which is projected to hit 18,000 trips per day by 2030, has made it difficult to access businesses along the Florida corridor, and several shop owners have seen a significant decrease in sales since the construction began last February. Steinberg, who has run the market for more than two years, said the city has failed to communicate a completion date. April Albert, owner of Blossom Durango, said her main concern is inadequate signs and the confusion her customers encounter while navigating through the detour to her flower shop. Blossom Durango opened last January – one month before the construction began. Albert said she had no idea about the extremity of the closures and detours before opening her business. The city will not reimburse businesses for losses, said Boysen, the city’s project manager. The city asked the contractor to do some extra work, including utility relocation and the addition of new water and sanitary sewer lines, once the need for them became apparent. Meanwhile, Boysen said the amount the company is being docked for failing to meet the December deadline on completion of the road is $2,500 per day. He said he hopes the late fees and the costs for the upgrades will come close to balancing out in the end. Florida Road in its earliest days was a cow path but over the years had to support heavier traffic as the agricultural outskirts were developed and annexed into the city. Patchwork fixes followed, with layer upon layer of asphalt applied. A $14.8 million construction bond was approved by voters in 2008 after another effort failed in 2002. A public meeting on the Florida Road construction project takes place 6-7 p.m. tonight in program room 1 at 1900 East Third Ave. The purpose of the meeting is to update the public on the project. Answering questions will be city staff, Concrete Express, Inc. and Muller Engineering.